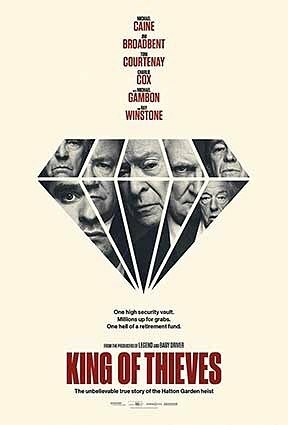 Based on a true story, this comedy drama is about the unlikely gang of retirees that pulled off the daring Hatton Garden jewellery heist of 2015. Developed from Mark Seal's Vanity Fair piece 'The Over the Hill Mob', the film tells the story of the epic multi-million-pound robbery initially believed to have been undertaken by a gang of super-thieves. The actual perpetrators were a group of tough-guy retired criminals in their late 60s and 70s — with all kinds of physical maladies — who were mostly unoccupied and bored, until they consulted a bunch of how-to books and figured out a way to pull off one last hurrah over a long weekend in April 2015. Entering the Hatton Garden Safe Deposit Company property via a lift shaft, they drilled through the 50cm thick vault walls with heavy machinery and escaped with a haul estimated to be worth around £200 million. The stellar cast includes Michael Caine, Charlie Cox, Michael Gambon, Tom Courtenay, Jim Broadbent and Ray Winstone. Tickets available from the Steyning Centre at £6.00 which includes tea or coffee during the interval. Wine can be purchased at £2.50 per glass. Doors open at 19:00 for a 19:30 start.